Albert Einstein was born in Ulm, Germany on March 14, 1879. As a child, Einstein revealed an extraordinary curiosity for understanding the mysteries of science. A typical child, Einstein took music lessons, playing both the violin and piano — a passion that followed him into adulthood. Moving first to Italy and then to Switzerland, the young prodigy graduated from high-school in 1896. In 1905, while working as a patent clerk in Bern, Switzerland, Einstein had what came to be known as his “Annus Mirabilis” — or “miracle year”. It was during this time that the young physicist obtained his Doctorate degree and published four of his most influential research papers, including the Special Theory of Relativity. In that, the now world famous equation “e = mc2″ unlocked mysteries of the Universe theretofore unknown. Ten years later, in 1915, Einstein completed his General Theory of Relativity and in 1921 he was awarded the Nobel Prize in Physics. It also launched him to international superstardom and his name became a household word synonymous with genius all over the world.Einstein emigrated to the United States in the autumn of 1933 and took up residence in Princeton, New Jersey and a professorship at the prestigious Institute for Advanced Study. Today, the practical applications of Einstein’s theories include the development of the television, remote control devices, automatic door openers, lasers, and DVD-players. Recognized as TIME magazine’s “Person of the Century” in 1999, Einstein’s intellect, coupled his strong passion for social justice and dedication to pacifism, left the world with infinite knowledge and pioneering moral leadership. So was his passion for Buddhism and its teachings. Today we present you Einstein’s world famous quotes on Buddhism that will be of a great value to understand how much the Buddhism was close to Einstein’s heart. 1) “Buddhism has the characteristics of what would be expected in a cosmic religion for the future: It transcends a personal God, avoids dogmas and theology; it covers both the natural and spiritual; and it is based on a religious sense aspiring from the experience of all things, natural and spiritual, as a meaningful unity. 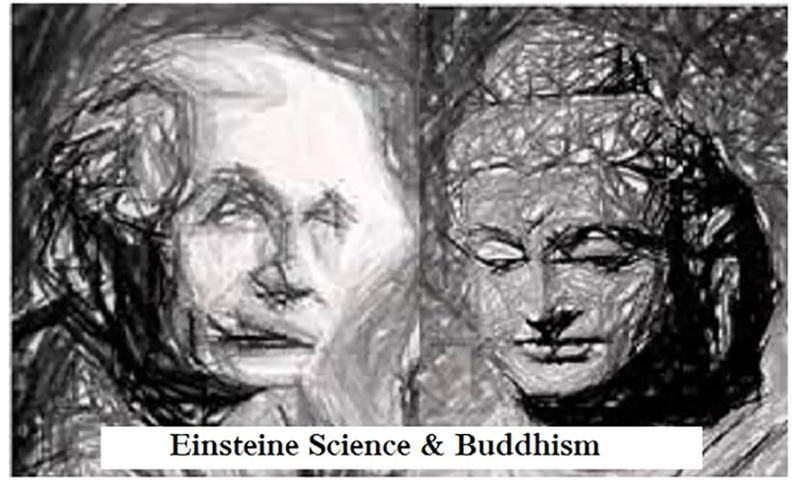 2) “If there is any religion that would cope with modern scientific needs it would be Buddhism. 3) “A human being is part of the whole, called by us ‘Universe’; a part limited in time and space. He experiences himself, his thoughts and feelings as something separated from the rest – a kind of optical delusion of his consciousness. This delusion is a kind of prison for us, restricting us to our personal desires and affection for a few persons nearest us. Buddhism is a living, growing religion today because it succeeds in conserving many of the highest moral values of its adherents. It promotes calmness and self-control, augments serenity and happiness, and does much to prevent sorrow and mourning. Those who believe this philosophy live better lives than many who do not. 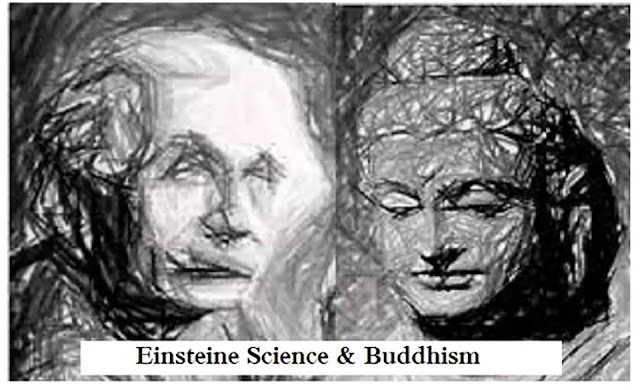 Einstein was one of many who saw light in Buddhism that helped him realize life better. He valued Buddhism over every other belief as he saw it was most appealing, relevant & logical to intellectual minds. At the time of this writing, much of Asia rests its hope in Buddhism. Will this noble faith that has so valiantly carried on through the dark ages of the past once again received the truth of expanded cosmic realities even as the disciples of the great teacher in India once listened to his proclamation of new truth. However, it’s evident from lately there is an incredible interest in the world for Buddhism all over again. This is mainly due to the science making many creator god concepts unreal and its exact match with the Buddhism that existed 2500 years ago. Buddhism, unlike many other teachings does not leave room for a closed mind whilst not stopping anyone accepting other teachings as plausible Buddha teaches his students to learn with their mind and don’t trust everything blindly, not even the words of the Buddha. One should understand, analyze and then decide if they find it true or not. “So why are you asking questions of little importance and not ask questions on the ending of suffering? In the world, there are people who are intrigued with heaven, there are people who are afraid of hell, there are people who wanted to learn supernatural powers, but these people just wanted to enjoy temporary happiness. However, one should learn the true happiness. The happiness or Nirvana. The end of suffering. Please also see below the famous parallel quotation by Einstein that helps you realize the similarities of science and the Buddhism. 1) According to general relativity, the concept of space detached from any physical content does not exist. 2) Physical concepts are free creations of the human mind, and are not, however it may seem, uniquely determined by the external world. All such notions as causation, succession, atoms, primary elements…are all figments of the imagination and manifestations of the mind. 3) Time and again the passion for understanding has led to the illusion that man is able to comprehend the objective world rationally by pure thought without any empirical foundations—in short, by metaphysics. By becoming attached to names and forms, not realising that they have no more basis than the activities of the mind itself, error rises…and the way to emancipation is blocked. 4) In our thinking…we attribute to this concept of the bodily object a significance, which is to high degree independent of the sense impression which originally gives rise to it. This is what we mean when we attribute to the bodily object “a real existence.” …By means of such concepts and mental relations between them, we are able to orient ourselves in the labyrinth of sense impressions. These notions and relations…appear to us as stronger and more unalterable than the individual sense experience itself, the character of which as anything other than the result of an illusion or hallucination is never completely guaranteed. I teach that the multitudinousness of objects have no reality in themselves but are only seen of the mind and, therefore, are of the nature of maya and a dream. …It is true that in one sense they are seen and discriminated by the senses as individualized objects; but in another sense, because of the absence of any characteristic marks of self-nature, they are not seen but are only imagined. In one sense they are graspable, but in another sense, they are not graspable. 5) The belief in an external world independent of the perceiving subject is the basis of all natural science. Since, however, sense perception only gives information of this external world or of “physical reality” indirectly, we can only grasp the latter by speculative means. It follows from this that our notions of physical reality can never be final. We must always be ready to change these notions—that is to say, the axiomatic basis of physics—in order to do justice to perceived facts in the most perfect way logically. While the Tathagata, in his teaching, constantly makes use of conceptions and ideas about them, disciples should keep in mind the unreality of all such conceptions and ideas. They should recall that the Tathagata, in making use of them in explaining the Dharma always uses them in the semblance of a raft that is of use only to cross a river. As the raft is of no further use after the river is crossed, it should be discarded. So these arbitrary conceptions of things and about things should be wholly given up as one attains enlightenment.